The Dow Jones today opened little changed on Tuesday as markets processed Monday evening's summit between U.S. President Donald Trump and North Korean leader Kim Jong Un. Trump said that the two leaders "had a terrific day" and that they have signed an agreement to build their relations and denuclearize the Korean Peninsula. 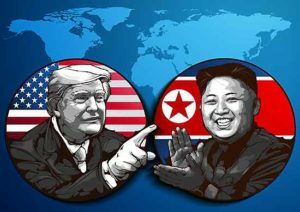 Money Morning Executive Editor Bill Patalon has warned readers about the mobster approach taken by North Korean leader Kim Jong Un. But – more importantly – Bill has become even more bullish on a special basket of stocks that he handpicked for his Private Briefing readers to cash in on the situation in the Korean Peninsula. Today, Bill offers our readers a few of his favorites as Trump meets with Kim Jong Un. Here's how to cash in regardless of how this summit turns out in the long run. Last night, President Trump met North Korean leader Kim Jong Un in Singapore. This was the first meeting between a sitting American president and a North Korean leader. Following the agreement, analysts noted that the document signed by both parties included no concrete details for achieving denuclearization on the Korean Peninsula. Trump responded to criticism by saying he is fully confident that the Korean dictatorship will follow through. A U.S. district court will rule on whether to approve an $85 billion merger between AT&T Inc. (NYSE: T) and Time Warner Inc. (NYSE: TWX). The decision comes after about six weeks of debate in a courtroom. The ruling will likely have a significant impact on the proposed bid by The Walt Disney Co. (NYSE: DIS) for media giant Twenty-First Century Fox Inc. (NYSE: FOXA). The Fed Open Market Committee kicks off its June meeting today. The U.S. central bank is expected to raise interest rates for the second time in 2018. On Wednesday, U.S. Federal Reserve Chair Jerome Powell will likely announce a hike of 0.25% to the benchmark rate to 2%. This would also mark the seventh hike since December 2015. Markets will be looking for clues during Powell's conference to determine how many additional times the Fed plans to raise interest rates during the final six months of the year. Restoration Hardware Holdings Inc. (NYSE: RH) stock popped more than 20% in pre-market hours after the company reported very strong profits for the quarter. The retailer reported earnings per share of $1.33, well above the $1.02 anticipated by analysts. The company also reported a strong second-quarter outlook, news that reduced concerns about it falling short of revenue expectations. Tesla Inc. (Nasdaq: TSLA) is taking heat this morning on accusations of union busting. An employee testified to the U.S. National Labor Relations Board that he was asked by security guards to leave his factory after attempting to hand out flyers encouraging the unionization of the workforce. The NLRB will now investigate whether the company violated federal labor laws. According to several Wall Street firms, General Electric Co. (NYSE: GE) stock is poised for a significant rebound this year. One analyst predicts it will rocket up to 50% higher in the coming months. Of course, that analyst couldn't be more wrong. Today, we take you behind the scenes to show you just how ugly the situation is at GE. Here are the three reasons why GE stock isn't going to outperform as Wall Street predicts. Look for earnings reports from H&R Block Inc. (NYSE: HRB), Casey's General Stores Inc. (Nasdaq: CASY), Science Applications International Corp. (Nasdaq: SAIC), Oxford Industries Inc. (NYSE: OXM), and Lands' End Inc. (Nasdaq: LE).